What are the effects of speedwalking compared with just strolling? You may have simply been walking at what felt like a natural pace. But then you go for a walk with a friend who has a faster stride and you realize that you can't keep up that pace. Do people who walk faster get more benefits from their walks? What are the Benefits of Speed Walking? Raises your heart rate to a higher heart rate zone. 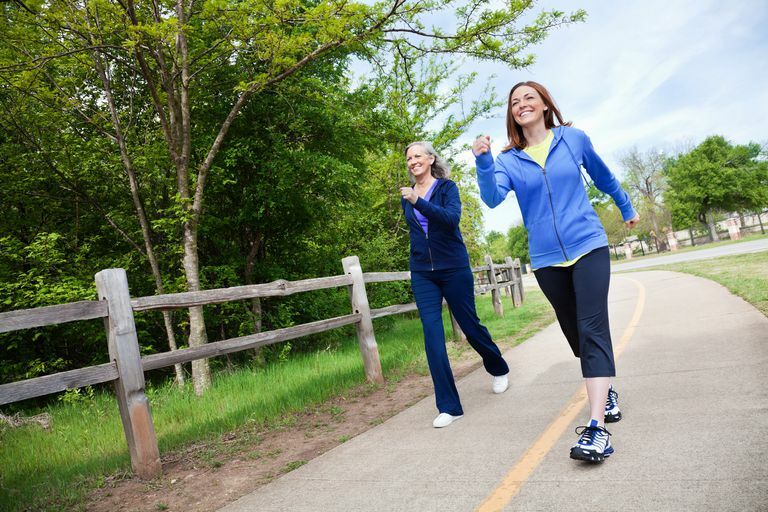 Easy walking is often done in the light intensity zone, while speedwalking will raise your heart rate into the moderate intensity zone and could even boost it into the vigorous zone. Shifts your workout goal from weight loss to increased fitness and endurance. Increases the flexibility of your muscles and joints as you use a wider range of motion. Enables you to finish same distance in less time. Increases impact. This is a two-edged sword. More impact can introduce or aggravate injuries. On the plus side, can build stronger bones and slow down osteoporosis. Regularly walking for 150 minutes per week in the moderate-to-vigorous intensity zone gives you the benefits of decreased health risks. How can you know how fast you are walking? You can use walking and running apps, GPS fitness monitors, or simply walk on a measured course while timing yourself. See how to measure how fast you are walking. You can also use a walking pace calculator to see how long it will take you to walk various distances. If you wonder how many calories you burn per mile at different speeds, see the charts of walking calories burned by distance walked. These charts are based on MET research that measured the calories expended in different activities at different speeds. The following chart was built with numbers provided by two walking experts in their books. They may not match the numbers you will see in the MET walking calorie calculator. The numbers for walking up to 5 mph comes from Gary Yankers in Complete Book of Exercise Walking. Numbers for walking over 5 mph come from Howard Jacobson in Racewalk to Fitness. The numbers given were for a 150 lb. person. To extrapolate to other weights, an increase/decrease of 10% for every 15 pounds was used. 2.0 mph 65 cal. 80 cal. 93 cal. 105 cal. 120 cal. 133 cal. 145 cal. What if you decide to start running instead? Maximum efficiency for walking is around 4 mph. Going faster leads to less efficiency and more calories being burned. For runners, maximum efficiency is around 6 mph. At speeds less than 5 mph, runners burn more calories than walkers. At 5 mph, the caloric burn is nearly the same. At speeds greater than 5 mph, racewalkers burn 20 percent to 30 percent more calories. See more about how running burns more calories than walking. Are You Ready to Walk Faster? How to Walk Faster: Use these tips for posture, arm motion and foot motion to boost your walking speed. How to Racewalk: Use Olympic racewalk technique for extreme walking speed.